It’s been awhile since we sent you an update on Cassie (formerly Cassidy) and we’ve had a lot going on recently, so I thought I’d shoot you a quick email. We recently moved to Texas, where some of my husband’s family lives. 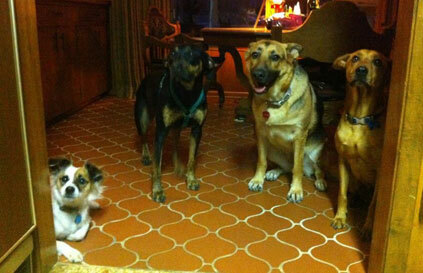 The attached is Cassie with her brother Ronnie (far right) and her cousins, Gizmo (far left) and Sofie (middle left). They have had so much fun playing with their cousins in the big backyard, going on walks to the neighborhood park, and taking trips to the dog park. We refer to Cassie as Miss Congenialty, as she’s always so friendly with the other dogs (and people!) and makes sure that she gets to meet everyone at the park whenever we go. For Christmas we drove to Florida and took both of the dogs, and all of our friends/relatives couldn’t stop talking about how calm, well-behaved and friendly they both were. Everyone just adored Cassie and couldn’t believe that she had been a rescue dog, meaning that once upon a time there had been someone that didn’t want her. We definitely lucked out when we found her! Thanks again for everything that you do, and all of the wonderful dogs that you help find loving homes. We couldn’t imagine our lives without Cassie!